With my daughter’s new interest in creative lettering I took a chance and printed out a few colouring quote pages from Activity Village and left them in our colouring in / template folder for her. When I first spotted the quotes I thought she might like the fact that they combined pictures around the words – a similar idea to the calligrams that she loved writing. She LOVED the pages. She liked the fact that they combined curly writing with big large capital letters and that some of the letters had pictures drawn inside them or around them or under them. She is still very new to doing “independent creative lettering” – her phrase which she says means she is still struggling to think of her own original ideas on ways to be creative with letters. And she says that while she colours the pictures in she starts thinking of new ways that she could write the same phrases. Small changes but still changes that she is thinking of. So sometimes some stunning colouring pages are NOT just colouring pages. Sometimes they give kids ideas on ways in which they can be creative, sometimes they can be a springboard for creativity. Even my youngest who is not into the current creative lettering phase joined in with the colouring quotes. He says having the words on the page makes it more interesting than a normal picture. The colouring in / template folder that we have is nothing fancy. It is a folder in which I keep printed out colouring pages and templates that I think the kids might enjoy. It is a combination of themes that I know the kids like (like animals) and also topics that we are currently learning about – so recently my daughter has been looking at creative lettering so I included these quote pages and we are starting to look at Egyptians so I added some new Egyptian themed pages. The idea is that the folder is always available for the kids (they don’t need to ask me for it, it is always within their reach) and that way they can page through it and take whatever pages that want out of it and use the pages in any way. There is never a wong way. If it is in the folder they can use it. We do sometimes use the folder for a joint art project that we have agreed on and I often use the templates in the folder for crafting projects. But the main point of the folder is that they always have access to the pages and there is a never a wrong way of using the page even if it is not what the page was designed for. 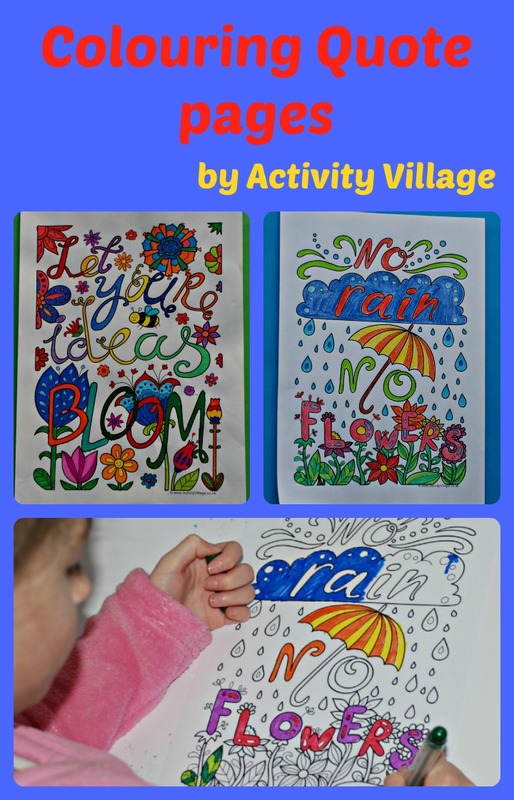 The colouring quote pages included above are these ones (All from Activity Village and all part of their membership package – think it is currently £15 for 12 months). This entry was posted in Art and Craft Ideas and tagged activity village, colouring pages, colouring quotes, Creative lettering, home education, homeschooling. Bookmark the permalink. I’ve never thought about coloring quotes in this way before. Creative lettering, how fun!